10s of 1000s of dead fish have reportedly turned up in Shinnecock Bay in Hampton Bays, New York, prompting the state’s Department of Environmental Conservation to launch an investigation. 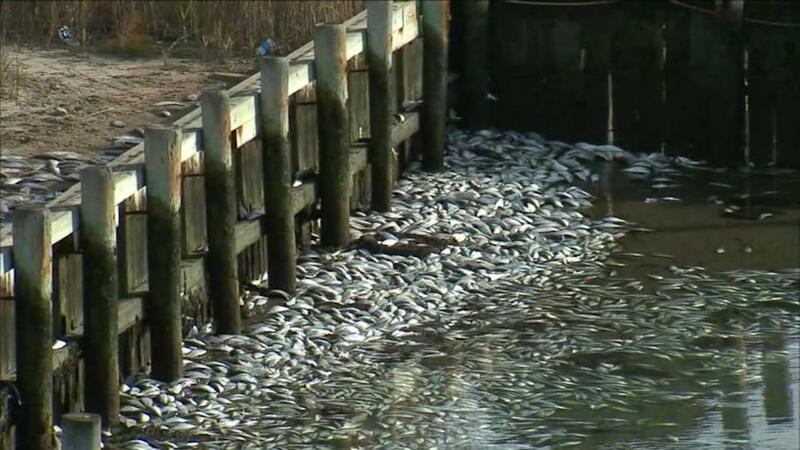 Predatory fish likely chased the “large, dense school of bunker (Atlantic menhaden) and other bait fish” into the Long Island bay’s canal early Monday morning, state officials told ABC News today in a statement. The fish were apparently trapped when the canal gates closed around 3 a.m. A preliminary field analysis suggested that the fish likely died bc of “a lack of dissolved oxygen & the high density of fish,” the conservation department added. The dead fish then entered the bay & washed ashore after the canal’s gates opened at 10 a.m., state officials said. The sight & smell of the 1000s of dead fish bothered locals on Monday, ABC New York station WABC-TV reported. “the fish kill does not suggest any impacts to the health of Shinnecock Bay,” state officials said, adding that environmental workers have collected water samples for further analysis. As a precaution, the Suffolk County Department of Health Services has also collected water samples to test for pathogens, nutrients & pesticides, department spokeswoman Grace Kelly-McGovern said. The results of the tests will likely be available in a few weeks, she told ABC News today. She added that most of the fish are no longer on the bay’s shore & likely sank to the bottom of the bay or were swept out to sea by the tides.